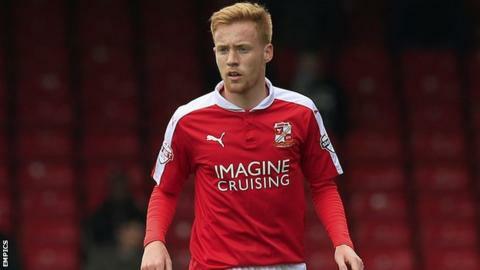 Swindon Town midfielder James Brophy says the team are not worried about relegation despite their seven-match winless run in League One. The Robins have not won in the league since head coach Luke Williams was given a five-year contract in March. They are currently 16th in the table, six points above the relegation zone with five games to play. "I think we know we've got the strength and the quality to stay up," Brophy, 21, told BBC Wiltshire. "I don't think anyone's looking over their shoulders, we've got a good enough team to cement our position in League One. "If we go on a good run in the last four or five games and get a few wins and a couple of draws everyone will change their mind about how the season's been." Brophy, who had been playing for non-league side Edgware Town before joining Swindon in August 2015, dismissed the suggestion that the club's current poor form is connected to Williams being given a permanent contract. "I think that's just coincidence - if you ask any of the boys in the dressing room they're all behind Luke," he said. "There's not many teams where managers give such confidence to the players to play with such freedom and use their ability, so I think all the boys would agree we're lucky to have him."